Flooding, desensitization, classical counter-conditioning and operant counter-conditioning are the 4 methods of behavior modification; but which one should you use? Many people are familiar with the terms and techniques but may lack the full knowledge needed to apply them appropriately. Improper or unskilled application can cause animals’ behavior to worsen. 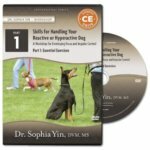 Discover how understanding the underlying principles and observing the animal’s response can increase your level and speed of success.